ANYWAY. Last year I supported a friend while she was applying to my alma mater for grad school, and she got in! (Yaaaay Jenna!) In thanks for my help, she got me a gift while she was traveling in Europe: nail art stuff! Haha. She knows me so well. ;) So let's take a look at what I did with the PUPA Milano Nail Art Mania Bubbles Set she got me! I've never tried anything from PUPA Milano before, and the set I got was PUPA Milano Nail Art Mania Bubbles in 002 Violet which included a bottle of microbeads and a bottle of matching violet polish. The polish went on lovely, though it had a pretty strong smell. After letting my first coat dry (yes, what you see here on my non-microbead nails is a SINGLE COAT) I put a second coat on my accent nail and poured some 'bubbles' on top. I made sure to focus my coverage on the top, so that I could pour on some silver to make a gradient-look at the tip. The silver is Essence Effect Nails 3D Pearls in 03 It Rains Money. I patted in some extra beads wherever there were gaps in the coverage, and then gently patted down the whole thing so that the beads were good and stuck in the polish. 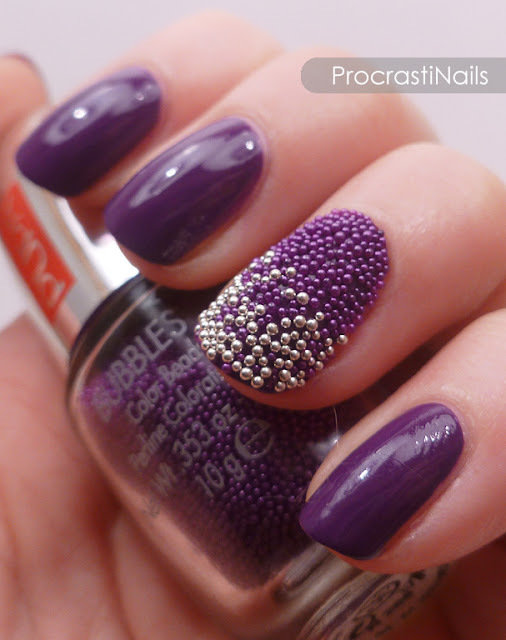 What you see pictured is polish and beads without any topcoat. I tried putting a layer of topcoat on this look after, and while one layer was okay two made it look really chunky and gross. The whole thing lasted about 2 days with two layers of topcoat though, which is good to know. What about you: still loving the microbeads trend or completely over it? Ahh, welcome back :) you've been missed. Oh, yes and - I love that colour! So so pretty. 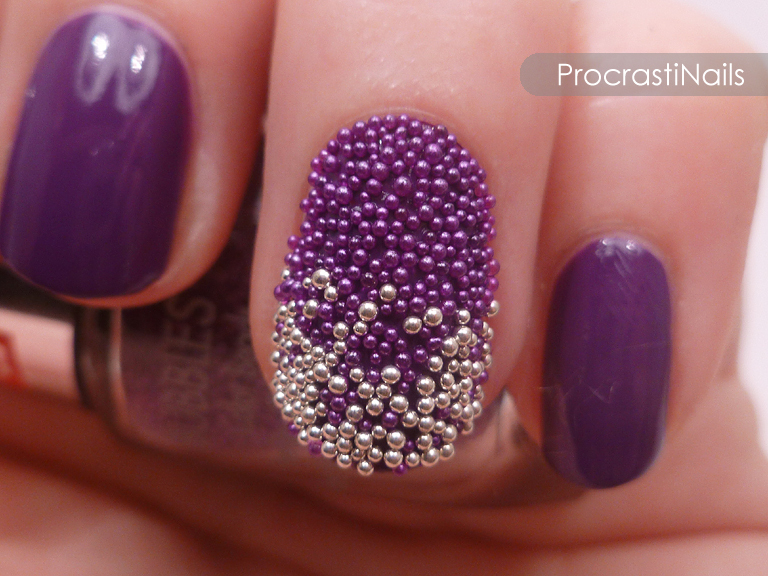 The beads, not so much..was never really drawn to this trend. Thanks!! I really like this shade, I just wish the polish didn't smell so strong! Thank you!! :) I tried. 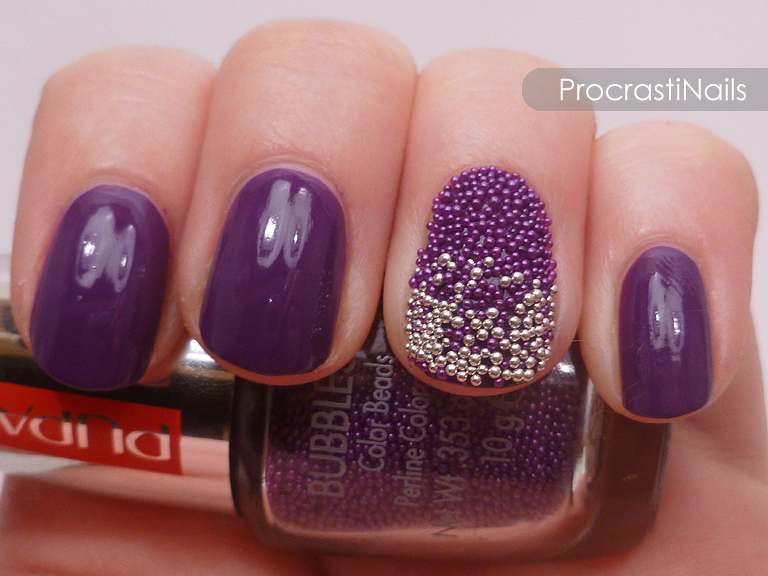 It was fun to do, even if there are now little escaped beads rolling all over my desk... Haha.